Anthony Gosselin is a running back currently playing with the Ottawa REDBLACKS. 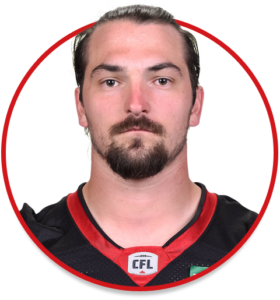 Drafted by the REDBLACKS in the 2th round, 18rd overall, in the 2017 CFL Draft. Played in eight games during the regular season and the only playoff game for the REDBLACKS. He ran the fastest 40-yard time for any running back or fullback at the CFL combine 4.73 seconds. Adding a 4.33 shuttle, 7.31 3-cone, 29,5-inch vertical and 9 foot, 4 3/4-inch broad jump. Among CFL scouts, Gosselin was the consensus top fullback available in the 2017 CFL draft.